The time has come to thank all of you, our readers, for this wonderful season. We at Misi.se will take a short break now, and then we will be back in force again sometime in mid to late August, ready to tackle another fantastic season. Awhile ago, we commented on a typical Gothenburg summer phenomenon known as ‘closed in July’. 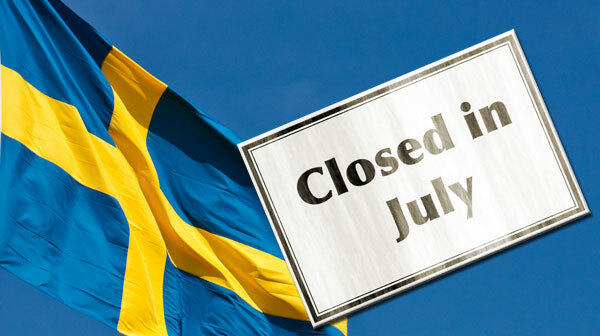 Although we are closed for a little bit longer than one month, it is rather fitting that we should close down during July just like so many other businesses in Gothenburg. It makes us feel very... Gothenburgish. For those of you who remain in Sweden over the summer and are wondering what to do now, Sera on the Misi team has put together a great list of festivities and events taking place in the summer, which we've turned into a pdf for you to download here (270KB). You can also browse our archives here at Misi.se, for instance to check out our articles on sightseeing and good barbecue spots, museums or whatever you're looking for. In mid to late August we will be back again with new articles, to keep you updated with the latest goings-on in Gothenburg, commentary on Swedish culture, practical guides and much, much more. We at Misi.se hope that you have found our articles interesting and useful, and that you will want to come back for more at the start of the next season. We hope that you will all have a fantastic summer holiday! As we would say in Swedish: Glad Sommar (Happy Summer)!